Rutland’s Color Booster Mixing Systems consist of single pigment color concentrates that were developed as a means of enhancing our finished ink mixing primaries by offering a darker, more saturated color. Rutland’s Color Booster Mixing Systems will create thousands of popular colors in a variety of product series simply by switching to the appropriate base. Rutland’s most popular color mixing system. All the primary ink colors are PANTONE® licensed. This high performance, low-tack plastisol color mixing system is designed for printing on 100% cotton fabrics. An excellent system for printing on poly/cotton blends when using a low-bleed underlay white. Our Finished Ink Color Mixing Systems allows printers to see a reduction in ink costs and an increase in production. Rutland offers a wide variety of bases, giving the printer more freedom of choice and helping to minimize inventory. Bases can be colored with the Color Booster concentrates. These special viscosity modifiers and additives were formulated to work with the Rutland screen print ink mixing systems and series to allow the textile screen printer to adjust inks to meet specific application needs. The most essential tool for any screen printer. Having many substrates in today’s market does not help with white ink selections. Rutland understands the challenge and provides the finest white plastisol inks available in the industry. 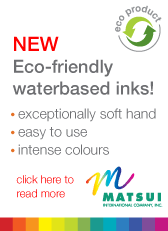 NSDS are distributors of both Rutland and Union Plastisol inks in South Africa. Plastisol inks are widely used in garment printing, as they are easy to print, do not dry in the screen, can be very opaque on dark garments, and will adhere to most textiles. Plastisol inks have one outstanding characteristic, they must be heated to dry. They will not dry, or cure, at normal temperatures. Plastisol inks can be printed on virtually any surface that can withstand the heat required to cure the ink and is porous enough to permit good ink penetration. Plastisol inks do not colour the fibres like a dye. Instead the ink wraps around the fibres and makes a mechanical bond with the fabric. For this reason, they will not adhere to non-porous substrates such as plastic, metal, and glass. They also will not adhere well to woven, waterproofed nylon material without adding a bonding agent. Another outstanding feature of Rutland Plastisol ink system is the M2007 software, which allows the user to access a formulation to make up any Pantone colour. This means matching to exact client specifications is easy and not time consuming. For more information contact us.